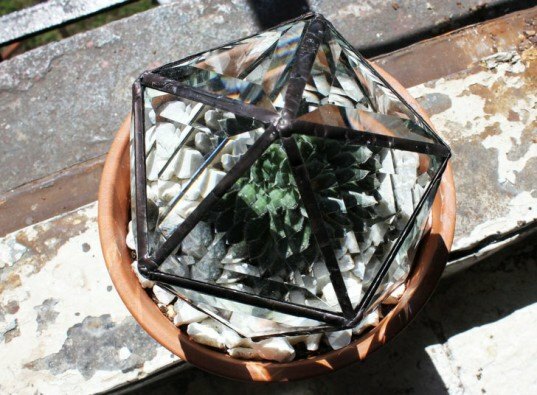 Turn Any Potted Plant into a Geodesic Crystal Terrarium With Halona's Plant Toppers! Brooklyn-based Halona Glass has created a series of beautiful glass enclosures that can transform any potted plant into a beautiful geodesic terrarium! The crystalline toppers fit snugly inside standard flower pots, and they reflect and refract sunlight to cast a burst of geometric shapes across any room. The multi-use terrariums are available in pyramid, crystalline, and pentagon shapes. Halona sources much of its glass from disused window panes, recycling each piece to create decorative and useful enclosures that display your plants while helping them grow. After cutting the recycled glass, Halona fuses the edges together and seals them with silicone. The bases are made from felt to prevent scratching when maintaining the plants they cover. 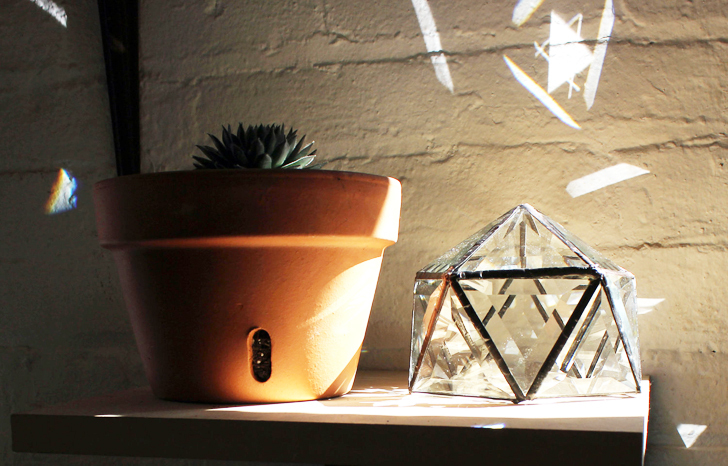 When placed by a window, the terrarium toppers create a dancing display of light. Inside, the plant is protected, as the bevel-cut glass ensures that light will bounce outside of the plant pot, and not create harmful direct light hotspots inside. Halona also offers prismatic terrarium kits which come with lava rock rocks and a pyramid prism which fits into a secure glass base. Each kit encourages urban gardening, while adding a little sparkle to your apartment. Halona glass ripped me off for over $200, she never sent the item I purchased over a year ago, made one excuse after another, and refuses to refund my money. Buyer Beware.